Income investors have been forced to search far and wide for income in recent years as the yields on bank accounts, certificates of deposit and other safe assets plunged towards zero. The search has not been easy but there are some areas that some investors may have overlooked. Farmland could be one of those undiscovered income opportunities. 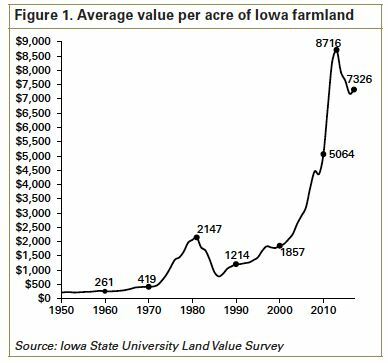 One source of data on the investment potential of this asset class is the University of Iowa Farmland Value Survey which was initiated in 1941 and is sponsored annually by Iowa State University. The survey is intended to provide information on general land value trends, geographical land price relationships, and factors influencing the Iowa land market. Data is based on reports by licensed real estate brokers, farm managers, appraisers, agricultural lenders, county assessors, and selected individuals considered to be knowledgeable of land market conditions. The data shows that farmland values have moved sharply higher this century before pulling back. A three year decline that started in 2014 was followed by a 2% gain in 2017. In addition to potential appreciation, farmland can be a source of income. Farm income is variable and depends on a number of factors. Of course, the truth is that farming is not easy. But, the chart below presents an estimate of the amount of income available per acre. 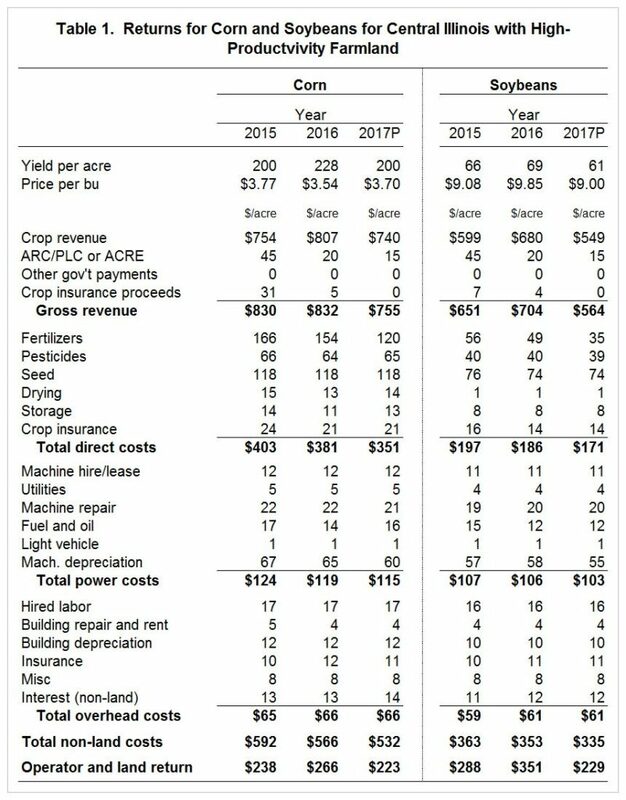 This is preliminary data and could change but the data indicates that farm land could offer returns to income investors and it could offer capital appreciation over time. Many investors will not be interested in directly operating a farm or putting themselves into a position where they risk more than they invested. An example of an investment where the risk exceeds the capital deployed is a futures contract. 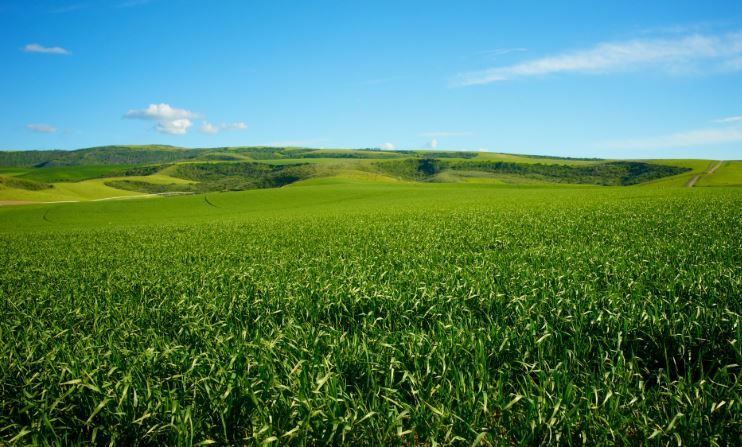 To meet the goals of investors with a desire to participate in the potential gains from farmland while limiting risk, Gladstone Land (Nasdaq: LAND) could be the answer. LAND is a publicly traded real estate investment trust that invests in farmland and farm-related properties located in major agricultural markets in the U.S., which it leases to farmers in Arizona, California, Colorado, Florida, Michigan, Nebraska, North Carolina, Oregon and Washington. Gladstone Land currently owns 75 farms, comprised of 63,351 acres. Its acreage is predominantly concentrated in locations where its tenants are able to grow fresh produce annual row crops (e.g., berries and vegetables), which are generally planted and harvested annually, as well as permanent crops (e.g., almonds, blueberries, and pistachios), which are planted every 10 to 20-plus years. While the land could appreciate in value, LAND could be primarily an income investment. The REIT pays a monthly distribution. The current per-share distribution is $0.0443 per month, or $0.5316 per year. The Company has paid 63 consecutive monthly cash distributions since it began trading in January 2013. Investors could also obtain this land at a discount. LAND reports the current fair value of its farmland on a quarterly basis. As of March 31, 2018, the appraised value of approximately $537.4 million, or an estimated net asset value (NAV) of the company was $13.57 per share. The share price is currently below the NAV meaning investors are buying the land at a discount while securing an income stream. Our goal is to continue to increase the dividend at a rate that outpaces inflation. As you know, I’m a large shareholder and I’m definitely liking dividend increases, and even if it’s only a small amount or a quarterly change. Since 2013, we’ve made 63 consecutive monthly distributions to stockholders. It’s [about $3.51 per share] total distributions. That shows the company is focused on its shareholders and that is a positive for investors considering this income opportunity. This company operates in a unique way. LAND acts as a real estate partner to farm operators. The company will purchase land and then enter into a lease with the farmers, often the same farmers who sold the land. LAND is also able to provide capital for land improvements. This is a valuable service to farmers. Many may want to expand or they want to improve their land, but they may lack the capital and loans for farms can be expensive when the farmer works with a local bank. LAND fills the role of buyer or partner in many cases. The company will usually work with sellers to complete a sale-leaseback, assume an existing lease or find a new tenant to farm the land. LAND’s goal is to always keep an existing farmer on the land for as long as they would like. A leaseback is an option that allows a farmer to, in effect, cash out, while continuing to work. This can be beneficial for estate planning and a number of other purposes. There is, and there will always be, a need for a leaseback where LAND buys land and immediately leases it back to the seller. Leases usually range between 3 to 15 years with options to extend. This provides stable income for LAND and its shareholders and allows the farmer to plan for the long term in relation to crop rotation and other important decisions. Rents are usually determined from market conditions, prior rent on the property and a capitalization rate based on the purchase price of the land. For example, if LAND paid $1 million for a farm, they might charge an initial annual rent of $50,000 or 5% of the purchase price. This provides a return on investment and funds the monthly distributions to shareholders. Again, the long term leases provide stability and that allows LAND to maintain a stable dividend payout to shareholders. This could be an ideal investment for income investors thinking of expanding their exposure to real estate.